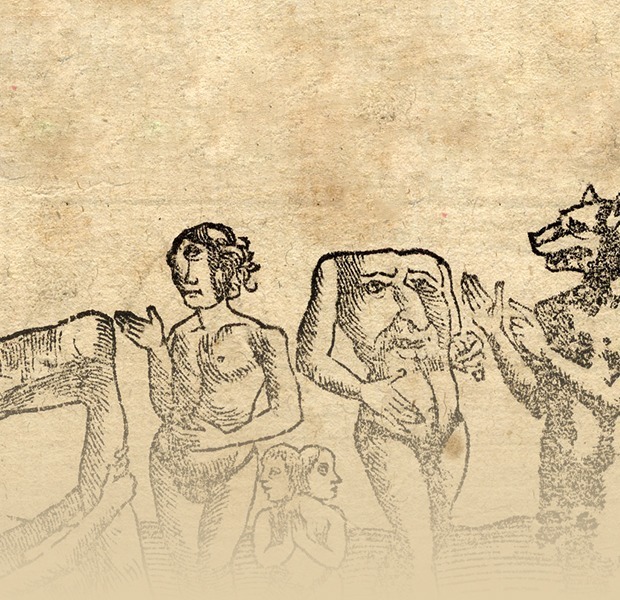 When Columbus sailed across the ocean in 1492, he was fully expecting to find dog-headed monsters and end time as he knew it, Toby Lester explained recently over the phone. This is the kind of salient detail that fills his historical odyssey, The Fourth Part of the World: An Astonishing Epic of Global Discovery, Imperial Ambition, and the Birth of America. The book explains a lot about early Christians' worldview. People didn't actually think the Earth was flat, for instance. Most of them fully believed Earthly Paradise to be a physical location. Directions (East, West, etc.) were not necessarily geographically accurate, so much as vaguely symbolic Biblical regions. Maps weren't exactly maps, but what Lester describes as "a form of lowbrow entertainment not unlike the one provided by modern tabloid accounts of various monstrosities." Hopes&Fears talks to Lester about the shape of the world in the centuries leading up to the completion of the globe. Toby Lester is the author of Da Vinci's Ghost (2012) and The Fourth Part of the World (2009). He contributes to The Atlantic extensively. His writing has appeared in The Smithsonian, The Boston Globe, The American Scholar, The Wilson Quarterly, BBC News Magazine, the Huffington Post, the London Times, and other publications, and in a number of anthologies, including The New Literary History of America (2009). In Aristotle's model of the cosmos, Earth bobbed in a sphere of water, surrounded by concentric spheres of air, fire, the sun, moon, and planets. Beyond that was a region of "neither place nor void nor time." The rotations came to represent a kind of celestial music, the "harmony of spheres." Christians adapted this model to the idea of "the world machine," in which the place beyond time represented the mind of God. Instead of being inside water, Earth was bobbed to the top of the sphere in order to make contact with the air. This meant that only one hemisphere was accessible to humans. People had to come up with these wackier and wackier solutions, until they just weren’t viable anymore. hopes & fears: Throughout your history of medieval cosmography, there are references to the “Earthly Paradise,” which map makers would often put on a map as a physical place. How seriously did people take the idea that there’s a location on Earth that is paradise, where you will go after you die? Did they think it was heaven? Toby Lester: They’re different concepts. What Columbus was looking for, and what you’re seeing on medieval maps of the world, is not heaven as you think about it today. It was specifically the Garden of Eden as it’s described in the Bible. The basic idea was that God creates the Garden of Eden and then puts Adam and Eve in it, and then they’re thrown out of the Garden, and that begins the march of human history. Gradually those first people move across the East, and then to Mesopotamia, then they spread to Africa and ancient Greece and Rome, and eventually they make it all the way to Europe. In Columbus’s frame of mind, human history had made that march all the way from the very beginning of time and space, at the beginning of Asia, all the way to the end of Europe. And to bring things full circle and end time, you had to go around the world to the beginning. A lot of people spent a lot of time trying to figure out the geography of the Bible. Some people still do. Part of the whole story was that it had been made inaccessible, and it was actually very hard to find. So you get stories of travelers who are clearly making things up—they travel out to the East and get close, but there are walls of fire, and it’s very high up, and four great rivers run down from it, and there’s a giant waterfall in one area, so it’s very hard to approach. Most people probably didn’t give it any thought whatsoever, just like today we don’t give a whole lot of thought to all sorts of things that we supposedly believe in. Those who did believe tended to be those writing the books and drawing the maps. In many ways, medieval maps of the world are much more layered and complex than what we use today. It’s kind of like taking a geographical backdrop and then projecting an entire progression of history onto it. H&F: There are a variety of terms used for medieval maps—“mappae mundi” [world maps], “cosmography” [maps of the universe], T-O maps [very simplistic symbols of the world], et cetera. What do they mean? TL: The terms that we use today don’t necessarily mirror the terms that people used in the Middle Ages. That’s actually an interesting starting point, because what we understand of mapmaking has evolved. We often make fun of the kinds of maps people were using in the Middle Ages because they looked so inaccurate. Christian maps of the world that aren’t drawn as a circle, that don’t look like the world as we know it now. Those were sometimes called “maps,” but they were also sometimes called “histories,” and likewise, a “history” sometimes might have been called a “map.” That gets at the point that medieval maps weren’t just geographical; they contained an element of time as well. 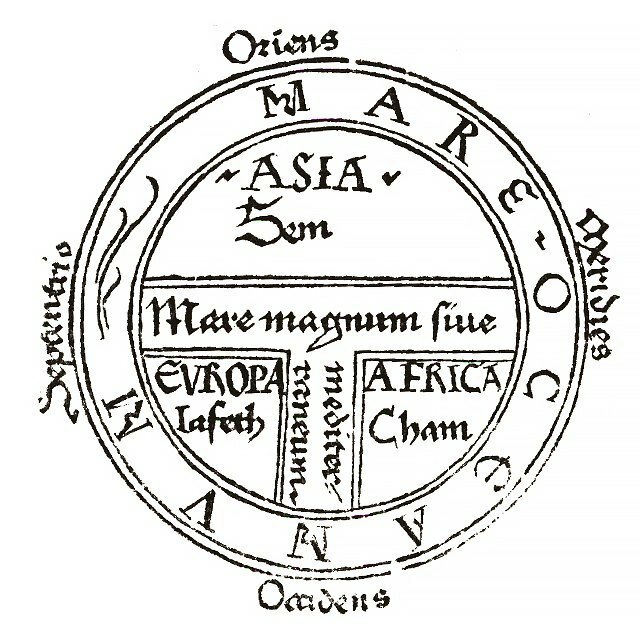 In the typical medieval framework, at least in the Christian west, you have the circle which represents the world. East (or Asia) is at the top because east is where the Bible says time began, it’s where the sun rises, and it’s also where God planted the Garden of Eden, so literally the place where human history begins. Europe and Africa are two symmetrical continents on the bottom. The Garden of Eden is way up at the top in the East, and then usually, you see a mix of biblical places and characters with some places from Greco-Roman mythology. H&F: You’re talking about the T-O maps? TL: Any of the circular maps. You have water separating the three continents in the shape of the T inside a circle of water, and that explains the name. It’s a model that dates back to ancient times. People were just saying that the world has three parts: Asia, Europe, and Africa. And they tended to give precedence to Asia and the East because that’s where time and human history began. H&F: So that goes back before Christianity, the idea that time and human history began in the east? TL: Yeah. It probably goes back to prehistory, simply from the fact that that’s where the sun rises, so it must be where things start. The Garden of Eden is way up at the top in the East, and then usually you see a mix of biblical places and characters with some places from Greco-Roman mythology. As you move down the map, there’s a kind of gradual march through religious imagery, mythical imagery, historical places and people, until you get to the bottom end of the map, which is Europe, the coast of Africa, and the Atlantic, where the sun sets. And in this kind of cosmological scheme of things, human history is going to come to an end. So what seems to be two-dimensional geographical map is actually a whole overlaid scheme of Judeo-Christian, and even Islamic history. You can find these kinds of maps in any one of those three traditions. 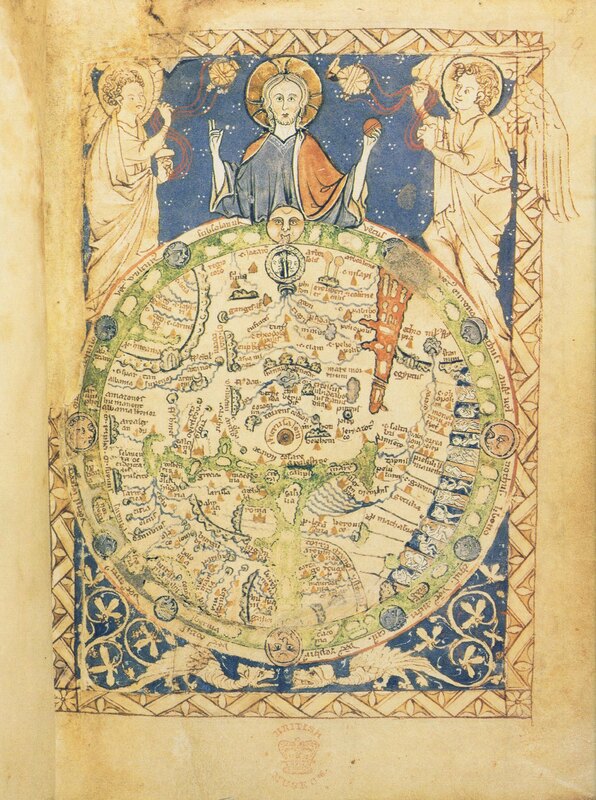 Medieval maps often represented the world as a circular, overlaid on the body of Christ. Jerusalem is located at the center of the world, on his navel. H&F: So that’s what Matthew Paris (a medieval monk and mapmaker) would have meant by saying that human history comes to an end when you end the march westward. 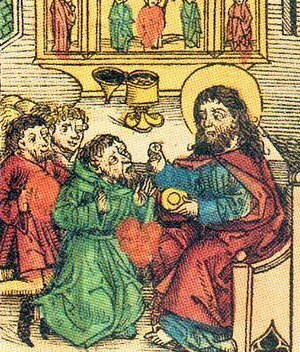 H&F: Why do you think the Prester John story lived on so long? TL: I guess a couple of reasons. One, as long as people hadn’t yet explored the whole world, when they didn’t find him where they thought he was, they could say “oh he must be over there.” Sort of like the idea that the horizon is always at the limit of your sight, but it’s always there. So if you could just get there maybe you’d find him. In the Middle Ages in Europe and it was a very powerful idea; Europeans really wanted to win this global battle with Islam for control of the Holy Land, and Prester John’s story meant there was another great, rich arm of the Christian world that was going to create a pincer movement on Jerusalem and unify the Christian world and finally take Jerusalem back for Christianity. Which would then set in motion all sorts of other great things. So there’s a certain amount of religiously-motivated wishful thinking. Prester John was a legendary immortal Christian ruler who reigned over an unknown Eastern Christian church. The legend was invented during the Mongol invasion, but stories about finding “Prester John” perpetuated through 15th century Portuguese explorations into Africa. 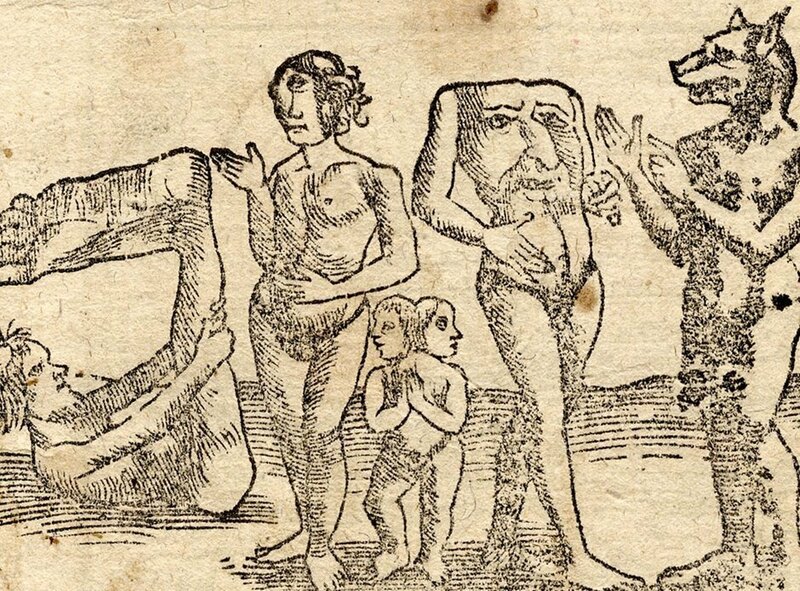 h&F: Early medieval, maps often depict monstrous characters like Gog and Magog, biblical barbarians from the East who were supposed to bring about end times. You’ve written that this was part genuine historical belief and part “tabloid” like mythos to inspire public interest. How much did mapmakers genuinely believe those characters to exist in a physical location? But once these maps began to circulate regularly, and people started talking about these races as actual races that existed out in the world, Christian theologians grappled with the nature of these things. Because Christians had the imperative to spread the gospel to the four corners of the Earth and convert everybody they could. So were these creatures people or were they monsters? If they were people, they had to be reached. Who are they and how are we supposed to handle it? People like Augustine actually grappled with these questions. There are some missionaries who went out to Asia a little before Marco Polo, earlier in the 13th century, and some of them were actively looking for the monstrous races. One man named William of Rubruck, for example, said he’d kept asking about the monstrous races, but nobody knew what he was talking about. H&F: Did that shake peoples’ faith in Christianity? That the monsters on the map weren’t real, maybe… then the Earthly Paradise wouldn’t be real? It’s human nature to be friendly with what you know and to fear what you don’t. What you don’t know tends to be at the margins of the world that you know. The farther you go, the weirder the things are. TL: I don’t think so. People have an ability to just adapt to new information and continue to believe what they want to believe. You had to gradually learn a little bit more, and some of your information gets contradicted, and you sort of let that fade away. But the fact is when Columbus sailed across the ocean in 1492, he was fully expecting that he was going to find dog-headed races in what we now know as the Caribbean. He thought he was arriving on the shores of Asia off the coast of China, but he was partly using books of earlier travelers, a lot of which were “embellished,” you could say. And that was, it turns out, one powerful motivating factor for him—by sailing westward around the world to the East, he was closing the circle [of human history]. Everyone knew the world was round, so maps were only showing you one side of the globe, and everybody kind of knew that on the other side, it was pretty much just water (or so they thought). And Columbus figured he could just sail around the back of the globe there and arrive East—at a certain point, he’d even reached the Earthly Paradise. He announced that very proudly in a letter back to the sovereigns of Spain. 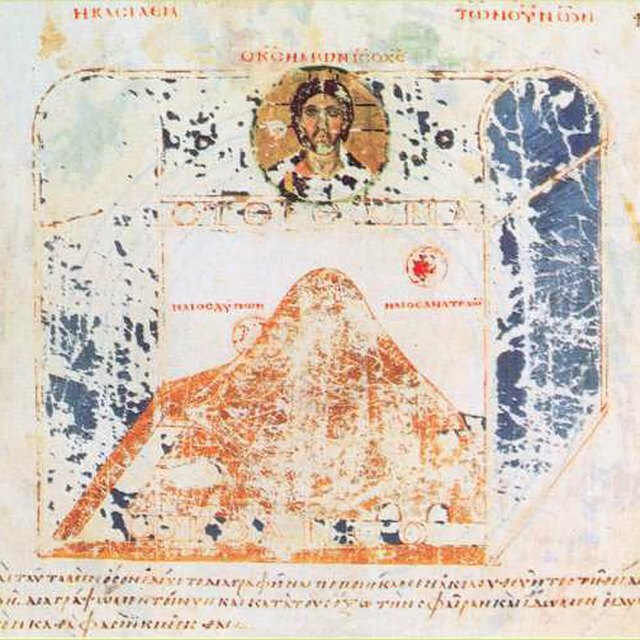 A 6th century text by Egyptian monk Cosmas Indicopleustes is said to contribute to the idea that medieval Christians believed the Earth was flat, though its significance is now thought to have been overrated. 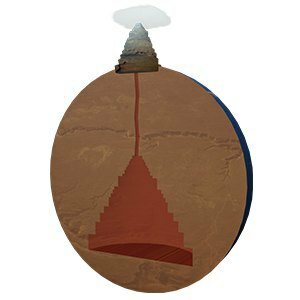 Indicopleustes believed that the Earth was a mountain inside of the vaulted box of the heavens. ← World map from "A Christian Topography"
H&F: Can we talk a little bit about the “world machine” and the idea that the Earth is an apple bobbing in a larger globe of water? How exactly does the world machine work? TL: It’s all based on empirical evidence. There was a long assumption, starting from an ancient Greek theory, that the universe consisted of a set of concentric spheres, and the Earth was the sphere at the very center of things. Assuming the Earth didn’t move, people looking up at the sky saw various things rotating around the Earth. Their theory was that these different objects were attached to spheres, and the spheres rotated. So there was the sphere of the sun and the sphere of the moon, and they were at different levels of distance from the Earth. Typically in the Middle Ages, people said there were seven planets, so we have seven spheres, one for each planet. Each of these spheres is rotating inside the one that is next largest. That’s what people are talking about when they refer to “music of the spheres.” That dates back to ancient times too, the idea that all of these spheres revolving at their different rates are creating a kind of heavenly music. H&F: So that would have been what the “world machine” referred to? TL: Sure, but then even, beyond all the planets, there’s this final sphere that has all of the stars embedded in it, and that’s rotating at its own rate. That entire machine of concentric circles, each revolving at its own rate around the Earth, is what you’d call the world machine. And then beyond that final sphere of the firmament, the fixed stars, is the prime mover, God, who is outside of the whole machine and therefore outside of time and space. God is the one who set that whole thing in motion. It was from a theory that the Greeks had evolved. The circle was the perfect shape, which made it an emblem of divinity. That brings me around to your question about the apple bobbing in the water. The idea was that the closest sphere to the Earth was the sphere of water. After that was a sphere of air and a sphere of fire, because if you light a fire, what happens? The fire seems to be lighter than air because it rises up. So there must be a sphere where that fire settles. But then if you actually think about it, if the world was really surrounded by a sphere of water, it would just be underwater. So how could that be? And once people started sailing around the world, you realize that Europe, Asia and Africa seemed to stick out one side of the world. So what’s going on? That’s not exactly symmetrical. That creates a problem for the model because everything is supposed to be perfect. So in the Middle Ages, the scholastic geographers came up with these very elaborate ways of explaining it away by saying that God had pushed the sphere of land out of the sphere of water on one side, and that’s what the Bible is describing when it talks about God making the land, because land that’s not water-logged is lighter than land that is water-logged, and therefore, even though the geometrical center of the Earth is no longer at the center of the universe, the center of gravity still is, so everything is still okay. It’s pretty convoluted, but it endured for a long time and people had to come up with these wackier and wackier solutions, until they just weren’t viable anymore. Christians adapted Aristotle's cosmos to the idea of "the world machine," in which the place beyond time represented the mind of God. Instead of being inside water, Earth was bobbed to the top of the sphere in order to make contact with the air. This meant that only one hemisphere was accessible to humans. 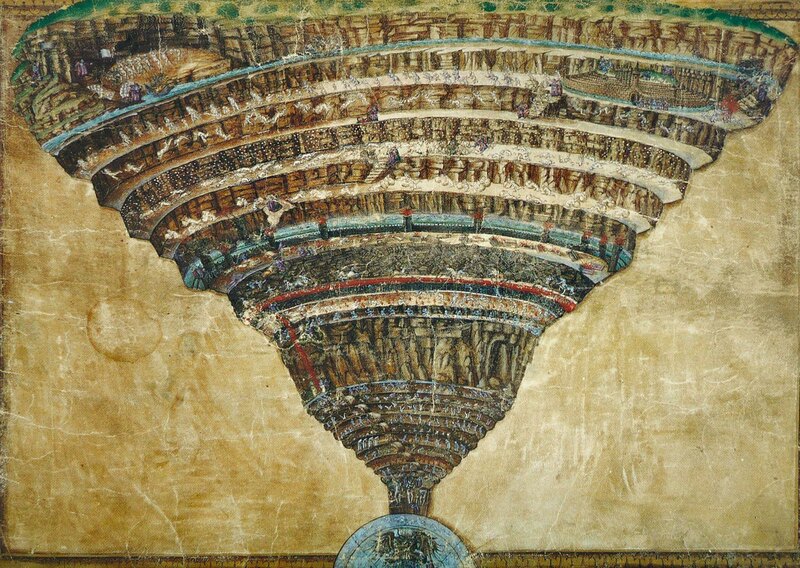 In his allegory Inferno, Dante envisioned Hell as a cavity in the center of the Earth, below Jerusalem. Hell had nine circles, with Satan at its center. Hell connects to Mount Purgatory on top of the opposite hemisphere. Earthly Paradise sits on top of Mount Purgatory, beyond which is Heaven. H&F: If you know that the entire Earth is surrounded by air, how would you conceive of an inner circle of water before… the sky? TL: Well, if you’re European, and you stand on the coast of France or Ireland, and you look out, it seems to be this vast ocean. And if you sail down the coast of Africa, that ocean seems to be on your right, everywhere you go. And then if you travel over land all the way to China there’s an ocean there. When you get to the margins of every part of the known world, there’s ocean. So it’s not illogical that what people came up with the idea of a spherical Earth, which was originally in the center of a larger globe of water, but then it bobbed up to one side of this globe. As it emerges from the water, you can see that it’s going to have a spherical coastline, roughly speaking. That is the known world, Europe, Asia, and Africa. And the rest of that globe of water is just going to be deeper on the other side. It’s a hard thing to grasp, but once you get it, that becomes very interesting. When the New World was discovered, Copernicus got very excited because if the Earth truly is a globe of land which bobbed out of one side of the globe of water, it makes no sense that, if you sail around the backside of the globe, there would be no way you could discover a giant continent, a new world on the other side. But they did. And what does that mean? To Copernicus, it was the beginning of a license to think that maybe this whole model was bogus– if Earth wasn’t at the center of the universe, then maybe we could differently about how all of these things are constructed.